Designed to provide a low cost chemical hood solution for protection of the operator and environment from toxic vapors, gases, fumes, and particulate. The AC600 Series ductless chemical workstation features the use of molded thermoplastics configured for a variety of common applications. 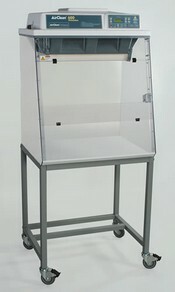 Smaller in size, it makes an excellent portable fume hood for the classroom or laboratory. 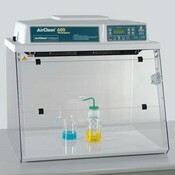 The chemical fume hood filter and electronics are located above the work area, eliminating the chance of a chemical spill entering these sensitive areas. The brushless, sparkless motor is post-filter. The deep base effectively contains accidental spills. The low airflow alarm warns user both visually and audibly. Width 32" 32" 32" 48" 48" 48"
Depth 25" 25" 25" 25" 25" 25"
Height 30" 40" 40" 32" 42" 42"
Width 31" 31" 31" 47" 47" 47"
Depth 23" 23" 23" 23" 23" 23"
Height 20" 26" 29" 20" 24" 27"